The Student Retention Predictor combines your institution’s enrollment data and data from the Ruffalo Noel Levitz College Student Inventory™ into a powerful statistical model that identifies which incoming first-year students are less likely to persist, and, of these, which students can be influenced to re-enroll. The Student Retention Predictor assigns every one of your incoming first-year students a score from .01 (highly unlikely to persist) to .99 (highly likely to persist), helping you target interventions and allocate resources where they will have the greatest impact on retention. The Student Retention Predictor also identifies key variables impacting student retention at your campus. How can you help more of your students succeed and persist? Contact our student retention strategists. Or call 1-800-876-1117 and ask to speak to our student retention strategists. We can answer any questions you have about the Student Retention Predictor and discuss assessment strategies, early intervention initiatives, proactive advising, and retention planning. 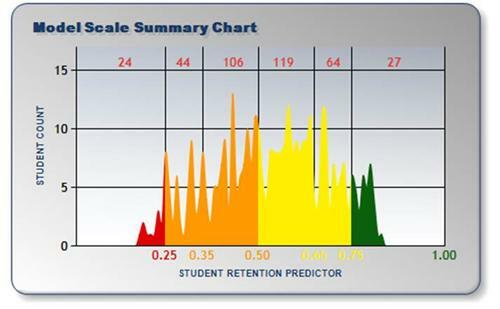 Download a PDF overview that introduces the Student Retention Predictor. The Predictor uses your institution’s past enrollment data to predict future retention results. Key for practitioners, the findings are available at the time of enrollment, so interventions can begin immediately without waiting for faculty or student affairs staff to raise alerts. See case examples. Colleges and universities that are using the Student Retention Predictor to redirect their campuswide student success initiatives, all across campus, are seeing an average increase of two to three percentage points in first- to second-year retention rates within their first year of using the data. These gains are being followed by further incremental improvements in subsequent years and are occurring on both four-year and two-year college campuses. Our secure, online Retention Data Center makes it easy for you to manage the data from the Student Retention Predictor as well as your other Retention Management System Plus components. Learn more. College Student Inventory™—Prioritizes retention interventions by assessing the noncognitive strengths and challenges of each incoming student. Administered before or early in a student’s first term. Mid-Year Student Assessment™—Equips you to strengthen student persistence by identifying changes in students’ needs at the mid-point of their first year. This is a follow-up post-test for the College Student Inventory. Second-Year Student Assessment™—Extends and strengthens interventions into the second year by surveying the noncognitive needs and motivational levels of second-year college students. Increase retention and completion with these early-alert and motivational assessments. Identify priorities for student retention and campus planning with these assessments for students, staff, and parents.